Must have attained the age of 18 years and must not have attained the age of 22 years as on 1st July, 2018 i.e., must have been born not earlier than 2nd July, 1996 and not later than 1st July, 2000. For Home Guards, a Person who, as on the date of notification, has been on duty as Home Guard for a minimum duration of 360 days within a period of two years and who is still continuing his service as Home Guard, must have attained the age of 18 years and must not have attained the age of 40 years as on 1st July, 2018 i.e., must have been born not earlier than 2nd July, 1978 and not later than 1st July, 2000. For the Post Code Nos. 26, 27 & 28 : Must have attained the age of 18 years and must not have attained the age of 30 years as on 1st July, 2018 i.e., must have been born not earlier than 2nd July, 1988 and not later than 1st July, 2000. Candidate if she is an SC or ST, must have attained the age of 18 years and must not have attained the age of 40 years on 1st July, 2018 i.e., she must have been born not earlier than 2nd July, 1978 and not later than 1st July, 2000. In the case of all other categories other than SC & ST, the Candidate must have attained the age of 18 years and must not have attained the age of 35 years as on 1st July, 2018 i.e., she must have been born not earlier than 2nd July, 1983 and not later than 1st July, 2000. Minimum Educational Qualification: Candidate must hold, as on 1st July, 2018, a pass Certificate in Intermediate or its equivalent examination recognised by the State Government. In the case of a Candidate belonging to Scheduled Castes or Scheduled Tribes, as on 1st July, 2018, he / she must have passed SSC or its equivalent examination recognised by the State Government and should have studied Intermediate and appeared for the Intermediate Examination in, both the 1st year and 2nd year. 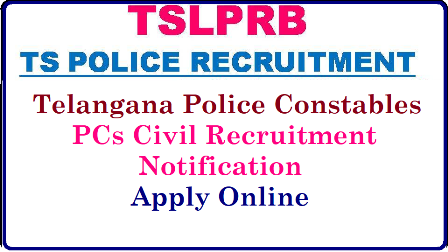 Fee: Candidates with local status of Telangana belonging to OCs and BCs applying for the Posts of SCT PC (Civil / AR / SAR CPL / TSSP), Constables in SPF, Firemen in TS Disaster Response & Fire Services Department and Warders (Male) / Warders (Female) in Prisons & Correctional Services Department have to pay a fee of Rs.800/- towards Registration of the Application, Processing of Application, Conduct of Tests and Examinations, Maintenance of Portal etc., Local Candidates of Telangana belonging to SCs and STs have to however, pay only Rs.400/- towards the same. All other Candidates will have to pay Rs.800/-. Fee may be paid at TS Online / AP Online / MeeSeva (e-Seva) Centres / through Payment Gateway (Credit Card / Debit Card / Internet Banking). * The questions relating to ‘English in the syllabus’ will be set in English only in the ‘Telugu / Urdu’ version of the question paper also.